Guan Yu can use any red hand card as an attack. At the beginning of his turn, Guan Yu can give any other character an attack. This is treated as if he used a duel. If the target as the same or more health, Guan Yu draws a card. "Fighting Monk" is very similar to regular Guan Yu's power. The only difference is that this one cannot use his equipped cards as attacks. Guan Yu can use his powers together. He can give a character a red card to a player to use "Pride". "Pride" takes place before Guan Yu's judgment phase. It is the first thing he can do every turn. 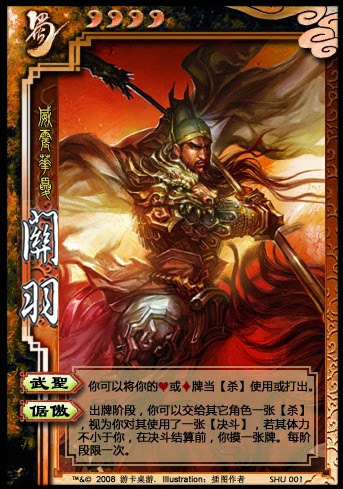 As soon as Guan Yu gives someone a card for "Pride", Guan Yu draws one back if the target has at least the same health.